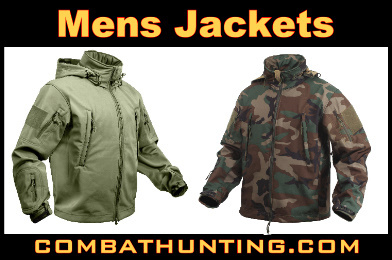 Shop a great selection of Mens Coats, Jackets and outerwear at Combathunting.com. Find a great selection of military tactical jackets, winter jackets, M65 Military field jacket all on sale! The Best men's tactical clothing and Rothco concealed carry soft shell jacket and military coats. We carry big men's jackets and outerwear. Shop the latest military jackets and clothing for men on Combathunting.com. You will find great deals on Military field Jackets, Camo Jackets & Coats, Flight Jackets, Military Trench Coats, Pea Coats Rain Gear and Ponchos.